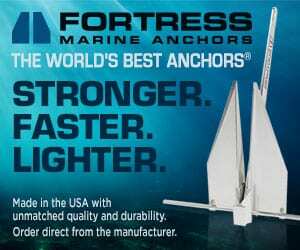 The SOG reads 27 knots when the captain goes in for a tight 360 outside Fort Lauderdale’s Port Everglades. Cushioned in the Stidd helm chair up top, I grip the armrests and brace myself. Surprisingly, I feel nothing. We barely lean into the curve as we make a neat, smooth turn in the choppy three-foot seas. We’re cruising on the first hull of Cheoy Lee’s Bravo 72, and while it may be just a few feet longer than the shipyard’s popular Bravo 68, it’s not an evolution or an updated model. This baby is all brand new. “We started from scratch,” says Panu Virtanen, vice president of yacht sales and new construction for Cheoy Lee Shipyards North America. Designed around the concept of easy boating for the owner-operator, Cheoy Lee opted for the joystick-controlled Volvo Penta IPS drives for Hull No. 1. “Volvo Penta is very strict when it comes to hull design and lamination, so they were a part of the process from the get-go,” says Virtanen. 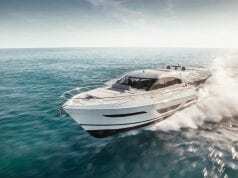 Working with Volvo, naval architect Howard Apollonio drew the optimal hull for the 800-hp IPS 1050s, which give a 28-knot top speed and 23-knot cruise. The power plants’ petite footprints leave plenty of room for maintenance in the large engine room, but the real bestseller, according to Virtanen, is the fuel economy. Volvo-led sea trials showed some impressive figures, particularly at low speeds where a 7.5-knot cruise sips only 4.5 gallons per hour total, and that’s including both engines. 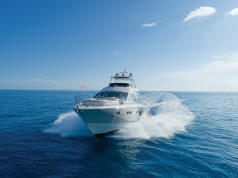 At 2,000 rpm, about 22 knots, the engines burn 54 gallons per hour. Volvo Penta supplied a comprehensive system from the electronics up top to the props below, so if there is ever an issue it takes only one phone call to resolve, greatly simplifying repairs for the owner. And that’s what this yacht is all about — bringing the fun back to boating by making it easy to run and maintain. That was some of the feedback Cheoy Lee received when querying owners of the 68 and clients interested in this size range. They used their responses to craft the 72. “We tried to put in everything. We really listened to what people were looking for,” says Virtanen. 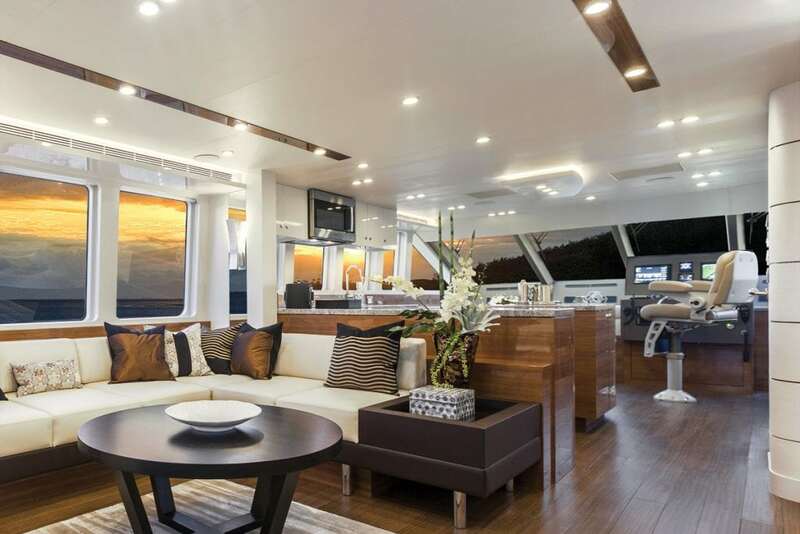 For the interior, the wish list included an open-plan main deck with 360-degree views. 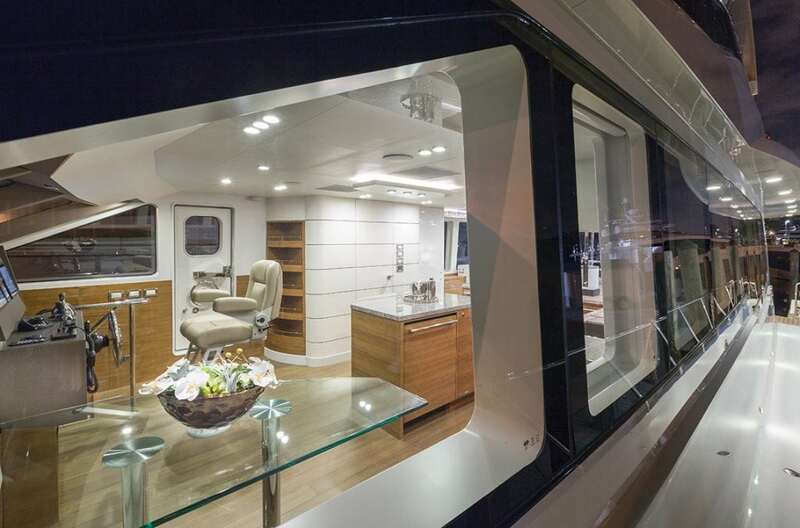 Counter-balanced doors lead from the congenial aft deck inside, where the salon flows seamlessly into the country galley and forward to the helm station. It is all on a single level surrounded by windows. The galley even includes refrigerator and freezer drawers instead of the traditional tall appliance that would have blocked the clear view. With the aim of opening up each area visually, interior designer Sylvia Bolton took a less-is-more contemporary approach and employed subtle details. For example, a glass table fronts the country galley’s settee, and a streamlined helm console eschews the oversized cabinetry of the past. She also pushed bulkheads out wherever possible and masked some structural elements between the galley and salon to look like cabinets. “My most important task in this project was to truly manipulate each space to its maximum. 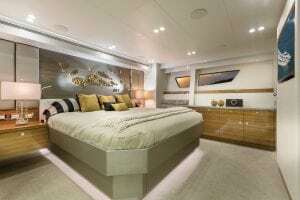 As I jokingly say, the most expensive commodity in a yacht’s interior is air and open space,” says Bolton. She was aided by a nearly 20-foot beam, which is wider than most in this size range. The all-around views are only briefly interrupted by a dayhead opposite the galley, but it is a convenience that was a must-have for nearly everyone Cheoy Lee consulted. 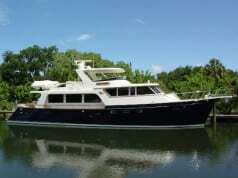 There are no interior stairs to the flybridge hogging precious space. Instead, Cheoy Lee opted for one substantial staircase from the aft deck. 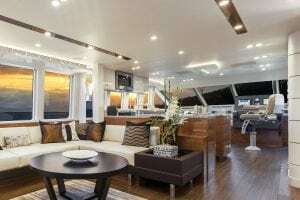 Below-decks, four was the magic number of staterooms that most clients requested, including—no surprise—a roomy master. Cheoy Lee came through with a full-beam king master suite. One of Bolton’s coolest tricks to increase interior volume was to open the twin sinks in the starboard-side bathroom to the stateroom, or they can be closed off with walnut-clad counter-balanced doors. The toilet compartment is private opposite the spacious shower. On the suite’s port side, a cedar loset reveals its surprising capaciousness when one peeks inside. Just outside the stateroom’s entrance is a stacked washer and dryer. For guests, there is a forward double-berth VIP with a nice-sized ensuite, and a twin and a bunk cabin that share a head. While most owners of a 72-footer intend to drive themselves, many told Cheoy Lee that they wanted the possibility of having a day captain on occasion. Buffering the engine room and master suite, the crew quarters is a pleasant spot finished to similar standards as the guest area with a bunk, mini-galley and head. Other bells and whistles on board include a TNT hydraulic tender lift on the swim platform, which comes standard. It lowers to launch the tender and rises to protect it when underway. Hull No. 1 is fitted with the optional TRAC zero-speed stabilizers, but it’s also gyro-ready to accept the Seakeeper SK-16 if one desires. 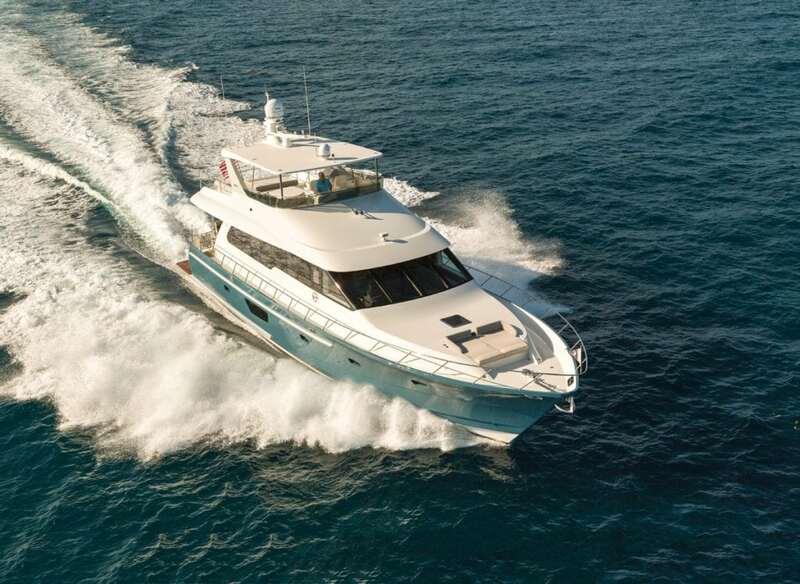 This hull is also home to twin Kohler generators with the Decision Maker 3500 for auto transfer and auto parallel load share—another standard feature. The Bravo 72 is the first boat in this size range to have the sophisticated system that takes the place of expensive power management systems. 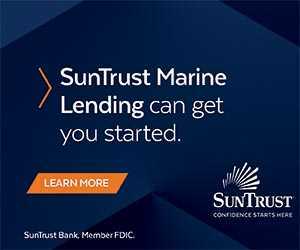 The top and aft decks are well-protected from the elements and for more coverage, optional sun shades can be fitted on carbon fiber poles to canopy the foredeck lounging area. At the end of our cruise, the captain shows off the incredible maneuverability of the pod drives as we approach the marina, deftly moving the boat sideways. But I would be remiss if I didn’t caution would-be owners: It’s so simple, your kids will think they deserve a turn at the controls!